Sunday 14th April- Junior Trials @ ???????????????????. 10:00am start. Sunday 28th April – Midland Alliance @ Florence BC, Stoke. 10:00am start. Monday 20th May - Jack and Jean Isherwood Qualifying 1pm @ ??????????? Saturday 1st June - Father and Son 11am @ ????????????? Monday 10th June - Shropshire Vets Merit qualifying 1pm @ ???????????? 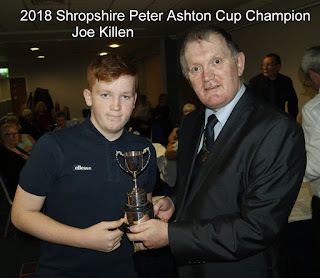 Sunday 23th June - Shropshire Senior Merit Finals @ ??????????? 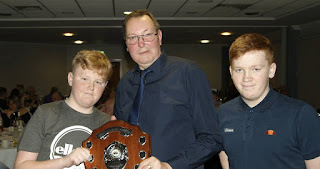 Sunday 30th June - Centenary Doubles/Dave Card Rosebowl @ ???????????????? Wednesday 3rd July - Isherwood Finals Day 10am @ ???????????? 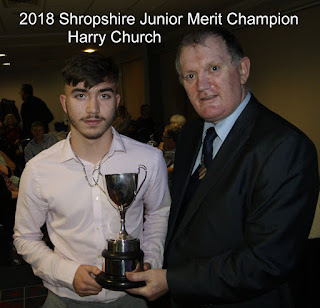 Saturday 13th July - Shropshire Junior Merit 10am @ ?????????????? Tuesday 16th July - Shropshire Vets Merit Finals 1pm @ ?????????????? Thursday 1st August - Veterans County Team Champs finals day 10am @ ?????????????? 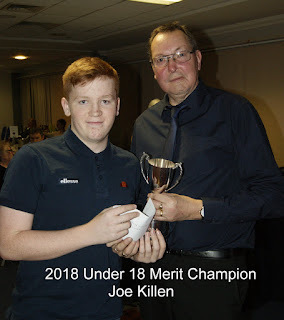 Saturday 17th August - British Junior Merit Finals Day 10am @ ??????????? Sunday 25th August - County Doubles 10am @ ????????????? Tuesday 12th February - Broseley Social in the large function room at the Social Club at 7.30pm. It's now 1-1 in the League's ladies versus gents annual end of season challenge match for the Dave Ellis Shield. After the men won the inaugural game at Sinclair last year, the ladies leveled the score with a 15 chalk victory at Allscott Heath on Saturday 29th September. They won seven of the 13 singles matches played with Sonya Lucas their 21-3 star and Pauline Wilson (21-13) and Louise Cotton and Angela Boot (both with 21-14 cards) getting them over the line. 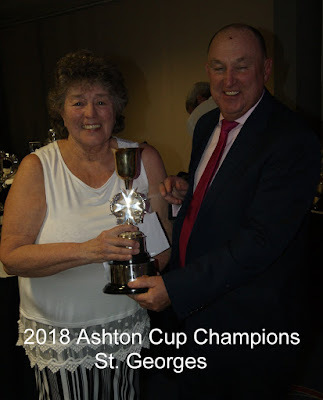 Pauline received the trophy from League secretary Malcolm Fletcher, who watched in dismay as the gents wasted an early lead earned by Jeff Davies winning 21-7 - Jeff being one of 12 homesters who took part in a fun night played in a real good spirit. For those of you who are not Facebook fans the following presidential post has been taken from the league social media site courtesy of Mike Potter. 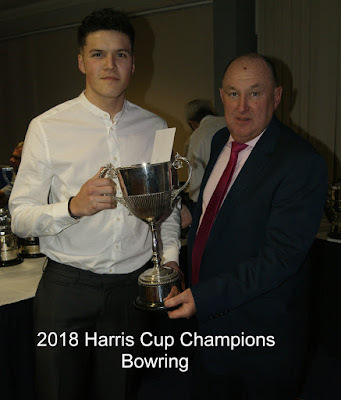 The families and supporters gathered at the Wellington venue of the Sir John Bayley Club where the Shropshire Premier League teams from Bylet and Bowring were to contend the final for the Mid Shropshire League's, Harris Cup. With a handicap based upon their finishing positions in their league the previous season, Bowring began the match with a slim 7 chalk deficit to their Bylet counterparts which after sharing the first four games was extended to 8 chalks in favour of the Bridgnorth, Bylet team. The middle four saw a repeat of the first as again the teams shared the games and Bylet further extend their advantage to 9 chalks. What was forecast to be a close encounter between the teams became reality when the scores were leveled as the 9th game ended that saw the volume ramped up a notch by the already vocal support for both teams which continued through to the finale that saw Bowring taking 3 of the last four and clinch a 7 chalk victory. 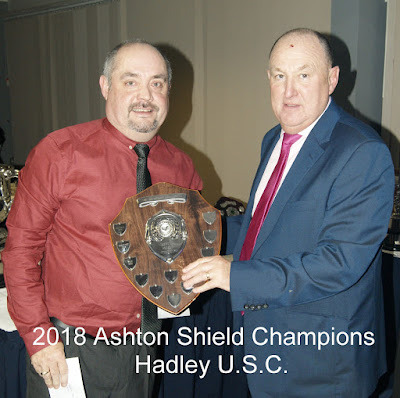 Malcolm Fletcher, league secretary was quick to acknowledge and thank the members of the host club and both teams on their contributions in the making of an entertaining evening before asking league deputy chairman, Dave Evans and match referee/league president, Mike Potter to present the trophies to the deserving teams.